Just a few minutes ago, I completed a post about a new franciscan bishop named for the country of Bosnia-Herzegovina (BiH) - Marko Semren, O.F.M. The fact that he is franciscan is what made it newsworthy to me. While franciscans had some prominence in the episcopacy for a period of time, the last two were succeeded by a diocesan line of priests going all the way back to the mid-1940's. So, this is the first franciscan to be on the Bishop's Conference of BiH in all this time. He will be an auxiliary bishop in Banja Luka. Because I gave some background in that post, I did not want to make it too long. What follows here is the homily given by the papal nuncio to BiH, Archbishop Allessandro D'Errico. He was in Banja Luka for the announcment on the memorial of St. Bonaventure. The Mass was concelebrated with Cardinal Puljic and Bishops Komarica of Banja Luka and Bishop Peric of Mostar-Duvno. Archbishop D'Errico touches profoundly on the life of St. Bonaventure and his love for the institution of the Church. There is one Church and unity is something to strive for, but not just any unity - unity within the local Church, which is united with the Holy Father. For anyone with an interest in Catholicism in BiH, including franciscan and diocesan relations, there are some thoughts he conveys worth pondering. I am glad that also today I see so great a celebration for the feast of St. Bonaventure, the heavenly patron of the Diocese of Banja Luka. I am happy to see gathered here not only Cardinal Vinko Puljic, the chosen son of this country, and our confreres in the Episcopate, but also so many priests, a great number of men and women religious and so many of the laity. I respectfully welcome the Vice President, Mr. Davor Čordaš, Consul of the Republic of Croatia, Mr. Francis Piplović, and the civil authorities present here. I am pleased to say a special word of appreciation and recognition to your bishop, the dear and esteemed Mons. Komarica - who since a few months ago is again President of the Bishops' Conference - for the tireless service that he provides in this particular Church and the Church in Bosnia and Herzegovina. I gladly accepted the invitation to propose some elements for consideration at this solemn liturgical celebration, to express to you in this way the spiritual closeness and support of the Holy Father, the head of the Holy See, and also at the same time the intense cooperation of the Apostolic Nunciature in the pastoral life of Banja Luka, which - despite so many difficulties - with courage and steadfastness continues its witness of fidelity to God, Church and Country. Of course I accepted the invitation of Bishop Komarica, because of the importance of this day, the liturgical feast of St. Bonaventure, who is a great image of the Master as a religious and a saint, and because I believe that his life and his works radiate a message that is alive and contemporary for our communities. As you know, St. Bonaventure was a contemporary of other great saints, like St. Francis of Assisi and St Thomas Aquinas. So he lived about 800 years ago. HIs date of birth is not exactly known, but is placed between 1217 and 1221. He was born in Civita di Bagnoregio, near Viterbo, Italy. His father was a doctor. At first he had the name John like his father. Then he changed it to Bonaventure, when he entered the Franciscan family. He taught theology at the famous Sorbonne University in Paris, then from 1257 (at age 40 years), he was Minister General of the Franciscan Order for 17 years. In 1273 (when he was 56 years old) his life underwent a great change: Pope Gregory X called him to be Bishop of Albano, and a Cardinal. And moreover asked him to prepare an Ecumenical Council in Lyon, which had the task of again establishing unity in the Church, that is, full communion between the Latin and Greek Churches. He devoted himself assiduously to this delicate task, but did not succeed in seeing the completion of the ecumenical session, because he died in 1257, while it was being prepared. He was 57 years old. One anonymous papal clerk left us a short but wonderful description: "A good man, kind, then also compassionate, full of virtues, beloved of God and people." He was a great saint, but also an excellent philosopher and theologian. And so for the works that he left us, after his death (1592) he was declared a Doctor of the Church, and was called "The Seraphic Doctor." My dear brothers and sisters, in recent days I have been asking myself one question above all: "What can St. Bonaventure teach us? The answer was simple: he can teach a lot, like every great saint. 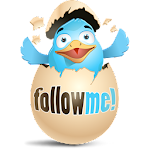 And here, in order to facilitate reflection, I would like to point out only two aspects of his character, which can be very useful for our concrete pastoral situation in Bosnia and Herzegovina. First of all, he cultivated a great love for St. Francis and the Franciscan Order. An event that happened while he was a boy, made a deep impresson on his life. He was struck by a severe illness. Not even his father, who was a doctor, hoped any longer to save him from death. His mother hastened to the intercession of Saint Francis, who had just been canonized, and she obtained his healing. Later, when he was a student in Paris, he remained fascinated by the ardent testimony and radical evangelical witness of the Friars Minor, who had come to Paris a few years earlier. It so happened that John knocked on the door of the Franciscan monastery in that city and asked to be admitted to the great family of the spiritual sons of Saint Francis. 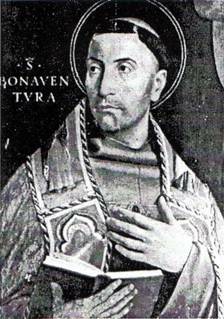 He was invested with the Franciscan habit in 1243 and was named St. Bonaventure (exchanging John with Bonaventure). - In the first place to the Constitution of the Order, which he prepared and had approved by order of the General Chapter (1260, Constituzioni Narbonensi). On these Constitutions were based all subsequent Constitutions of the Order. - Then, the life of St. Francis, which he personally prepared (entitled Legenda Maior), which became the official biography of Saint Francis, at a delicate moment in Franciscan history, when conflicting interpretations of the life of the founder were in danger of causing serious tensions and divisions. The image of Saint Francis, which flowed out of the heart and pen of his loyal son, St. Bonaventure, is that the man from Assisi was a poor person who passionately sought Jesus Christ, who knew him and loved him. Out of love comes imitation, and so he became like him completely. St. Bonaventure with fervor of faith dedicated himself and particularly all followers of Saint Francis to this model. But this model is valid for every Christian, yesterday, today and tomorrow. It is a program of the spiritual life, that is valid also for us today. And today as we celebrate the great patron of Banja Luka, we are called to live this ideal every day in our life. In other words it is according to the life of St. Francis that St. Bonaventure invites us to know Jesus, to love Him and to imitate him, to put Him in the center of our life, and - especially in difficulties - to be with him on the cross, to take up our cross every day, so as to share with Him in the dawn of resurrection and life. The other aspect of the personality of St. Bonaventure which I think is very important for our communities, is his great love for the Church. He witnessed his love for the Church not only during the time of his episcopal ministry in Albano and of preparation for the Ecumenical Council of Lyons, but through all of his theological and spiritual works, his sermons, and his academic activities in Paris which speak of him as a loyal son of the Church. He wanted to institutionalize this unconditional love for the Church in the Franciscan Order when he was invited to be Minister General. 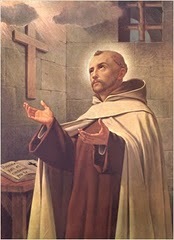 And so, with the above mentioned Constitutions which he prepared for the Order and that were approved in1260 at the General Chapter of Narbonne, he wanted to arrange the life of the Franciscan Order in a harmonious way and with a desire to actively include the Order in pastoral ministry and in the organized and institutional structure of the Church. This is an essential element, because there is always the danger of opposing the charismatic-spiritual dimension to the institutional-canonical dimension. In those days that danger was quite present when many of the friars - under the influence of the thought of Joachim of Florence - emphasized the prophetical - radical poverty view of simple Franciscanism. For St. Bonaventure the Franciscans - with their charism, their religious consecration, their daily breathing in the life and example of Friar Francis - have to live and actively be involved in the institutional church. 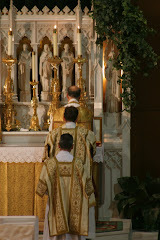 And he never tired of repeating that the Church can be made even more luminous and even more beautiful by fidelity to the vocation of those sons of hers who were called by Jesus to observe the evangelical counsels of poverty, obedience and chastity (and not just the Commandments), as happened with the rich young man from the Gospel. It is a matter of service to the one Church of Christ, each one in fidelity to the talents received, which the Holy Spirit bestows for building up the Body of Christ. 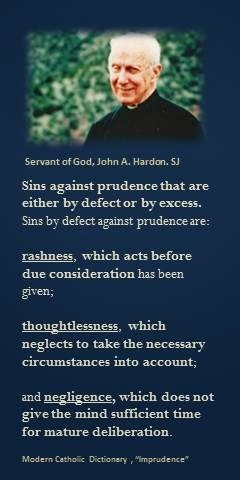 This helps us still better understand why St. Bonaventure consented to be a Bishop and a Cardinal. His example opened the way. 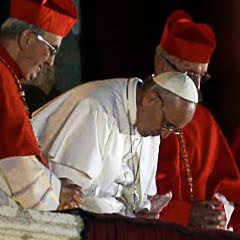 And so still also today the Holy Father - as many Popes have also done throughout history - continues to call many men religious and many members of the great Franciscan family to become Bishops, or also Cardinals of the Church of God. Today, after many centuries, we can affirm without shadow of doubt how really great a contribution it is that St. Bonaventure made toward the proper ecclesiastical placing of religious life. And that really explains why he is considered practically to be the second founder of the Franciscan Order. My dear brothers and sisters, the example of love for the Church which comes to us from St. Bonaventure is of special importance for our communities in Bosnia and Herzegovina, which are traditionally marked with the apostolic zeal of the Franciscan friars. I have already had the opportunity in various circumstances to say - and I am happy to repeat also today - that already from my arrival in Sarajevo, I have been touched by the solid organization of these particular Churches. I am still more amazed when I consider that this is being achieved despite the limitations in resources and personnel, and despite the trials which the Church in this part of the world has had to face even in recent times. Yet I still can not conceal that the Holy See, and indeed the Holy Father himself personally today is seeking an extra effort, asking for greater attention to certain painful questions, mostly inherited from the past. I am thinking especially about the mutual relations between diocesan priests and institutions, on the one hand, and religious families (male and female), on the other. In these years I have seen so much goodwill. That needs to be said again today on the feast of St. Bonaventure, who is a renowned teacher of love for the Church. It is necessary for everyone in their heart to have a better collaboration and a greater understanding between diocesan and religious personnel. In other words, I would invite all to give a lot of thought to the urgency of clarifying the difficulties that still exist and work together in the one Church of Christ: in this specific church and for this specific church. 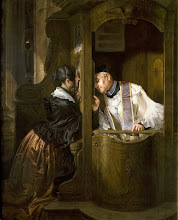 Before the difficulties that come from outside, and before the misunderstandings and tensions that also exist within the Christian community, there is always the risk of discouragement; and also a temptation to "withdraw", and to "wash one's hands" a little, thinking that the bishops and those who have a greater role of responsibility in the Church should solve the problems. So, I believe you will agree with me about the need for each one to feel obligated to do their part, with a sense of Christian responsibility. There is someone who can do a lot, and there is someone who can do a little less. This is the parable of the talents. And if the sense of personal obligation matures in each one, I believe that both your bishops and religious superiors will more easily find just solutions to the challenges we are called to confront. Each individual's growth in holiness is a key to unity in the Church. There cannot be a unity of this group of Catholics, or that group of Catholics, which are opposed. "North" cannot be this way and that way - but only one way. Two feet on one body cannot move a single body forward, if each is going it's own way. 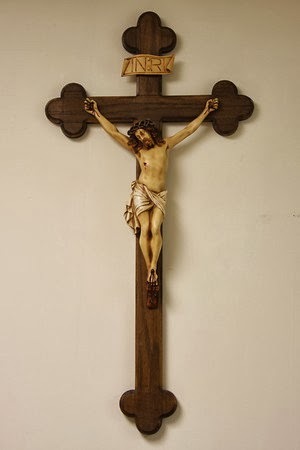 Rather, the works of these various groups, such as diocesan priests and their parishioners, and franciscan priests with theirs, should compliment one another with their God-given charisms just as nerves compliment the brain, and the blood vessels of the human body compliment the heart. The heart cannot do the work of blood vessels, nor can the blood vessels function like a heart. Rather, they must work in harmony toward's a common end. 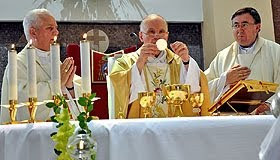 In the life of the Church, institutionalized by Christ, various religious orders of priests, for example, play a complimentary role to diocesan priests, and vice versa. Both must work in harmony with their respective local Church through the bishop, and the bishop in harmony with the Holy Father. When the bishop, in harmony with the Holy Father, is followed, it results in peace and unity. It may be that, at times, that there are two "good" ways to do a single thing and people disagree. In a specific, local Church, in order to maintain unity, we offer a sacrifice to God of our will, for the will of another. That is, we offer that will first to those pastors who are united with the bishop, and to the bishops united with the Holy Father. When all work in this way, disunity is diffused and replaced with unity. And, when unity is strong within a specific, local Church, the task of working toward's unity with others - non-Catholics, non-Christians, etc., it becomes not only easier, but their work will be blessed by God. One of the most fundamental steps that everyone can take towards growth in personal holiness, is to pray ardently for the bishops and priests who have been sent to us by God. Not only will they receive graces, but so will those who pray for them with pure intentions.